There's a lot happening in our vibrant and growing school! Check this page often to help you say up-to-date. 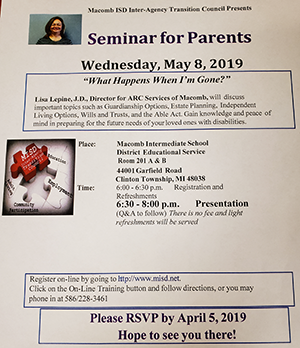 Please join us for a parent seminar on May 8 from 6:00 to 8:00 p.m. From 6:00 to 6:30 p.m., we will have registration and refreshments available, and the presentation/Q & A will follow. This is a free seminar. You can apply online or you can call (586) 228.3461. Please RSVP by April 5. Lisa Lepine, J.D., the Director for ARC Services of Macomb, will present this seminar, What Happens When I'm Gone? She will discuss important topics such as guardianship options, estate planning, independent living options, wills and trusts, and the Able Act. Come gain knowledge and peace of mind in preparing for the future needs of your loved ones with disabilities. 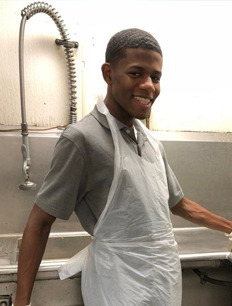 See how our students keep busy.